My husband and I tend to make our major decisions spontaneously, and we follow through decisively. For example, consider the day we got married: a Friday in 2007, two days after Valentine’s Day, on which we woke up and both said, “Oh hey: this would be a good day to get married.” I had purchased a black dress from a big box outlet a few days prior, my husband had a patterned sweater and button up to wear, so we took our “fancy” clothes with us to our university and waited for the right moment to present itself. Lo and behold, a class of mine was cancelled and he was free, so off to the courthouse we went. I’ve never regretted the way we got married… but sometimes, oh sometimes, I would love to have a reason to don something like the McKenna Day Dress pictured first below. Long sleeves, tiny belt, lots of lace for $350? SIGH: it’s my dream wedding dress. 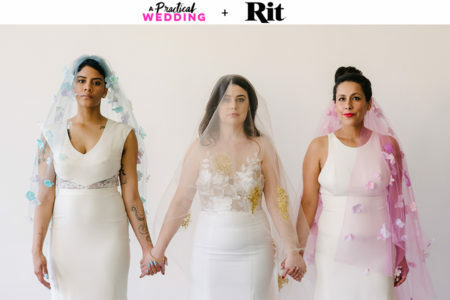 When I got married, there weren’t a million wedding blogs out there, busy compiling lists like this one—forty-plus incredible wedding dresses for under $1000. If there had been, I might have realized sooner that weddings don’t have to break your budget. Luckily for you, it’s 2017 and making these lists is kind of our favorite thing (ahem: here’s one with gowns under 0… and plenty of them are still available and even cheaper). This particular list has a little something for us all: there are dresses with plenty of sparkle, deep v-necks, and up-to-there thigh slits. You’ll also see long sleeves and soft patterns, and holy moly there are a handful of pink dresses on here that make me want to turn cartwheels (down an aisle). If you’re looking for even more affordable and fabulous gowns (including plenty of plus size options), we have a whole bunch right here.